clever solution... just don't injure your "good" knee while scooting. for as good as the bus system in CU is supposed to be, i agree... i was really disappointed at the convoluted route you'd have to take just to go a couple miles down the road to work. Now I've seen everything! Scooter. That's funny. Hope your knee heals quickly. Maybe you can bring it out to the Mahomet trails and "do" the bike path on a Thursday evening with the buffalo. IT's actually a very clever solution! "OH COOL! Can I have one for my birthday???" Hope the knee feels better soon! I know it is tough to be on the sidelines. Though you are not on the bike, you've lost no points in the Hardman rankings. Your commitment to driving as little as possible is commendable, but you might find it much harder to sustain once Fig arrives. Good to see you and Melissa out at the race yesterday. My doctors appointment to get the knee checked is the 21st, when's yours ? Rob, how about a Trikke? you guys probably don't know, but scootering is a freestyle sport, to find out more visist www.theridewire.com or www.scooterresource.com. if you want a really stable scooter it would be a good idea to buy a TSI 5 inch deck, it is 5 inches wide, and isn't foldable (one peice) you also may want to put a wider crossbar for the handlebars for your comfort. This is not as unusual as you might have first thought. 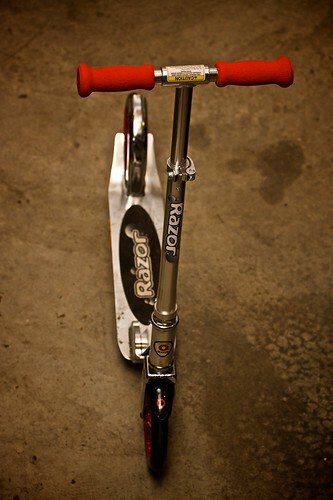 I am in college and part of the Razor Crusaders [http://www.razorcrusaders.com] and we rode ours on a 65 mile trip and my Razor Pro model still works today! We even had the news chopper follow us on that excursion. I really want to go for riding in the park with my son. Therefore i am looking for an adult kick scooter. Any suggestions?